In the late 1800s and early 1900s a now illegal practice was once quite common – requiring capable institutionalized patients to work on asylum grounds. 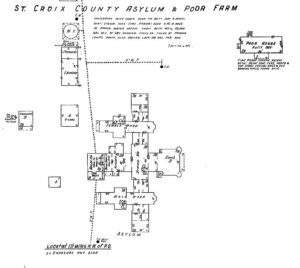 St. Croix County was not foreign to this idea; the St. Croix County Asylum operated a 667 acre farm that was run by its patients. Asylum culture has drastically changed as time progressed. However, the St. Croix County Asylum is an interesting piece of both medical and agricultural history that greatly impacted the county. The first patients were admitted to the St. Croix County Asylum on April 27, 1897. 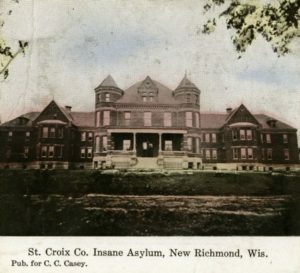 The asylum admitted approximately 100 patients its first year, 48 of which were from St. Croix County. For economical purposes, superintendent T.D. Wheeler opted to make the asylum self-sustainable, which was a fairly common practice during the period. By September 30, 1897 the livestock counted on the asylum grounds was: 21 cows, 17 hogs, 14 pigs, 7 horses, 7 calves (and a partridge in a pear tree). According to the article “St. Croix County Asylum and Poor House” compiled by historian Nancy Hawkinson, patient labor was used to excavate and farm the majority of the buildings and surrounding acreage. For example, “Patients hauled something over 30 cords of rock for the foundation of the horse barn, and also hauled all the lumber and building materials which went into the horse barn…forty acres of land was grubbed and cleared, 202 wire screens were made for the asylum windows and all the barns painted with asylum labor” (Hawkinson). This example is merely a glimpse into the labor that asylum patients underwent during their stay at the County Asylum. The work accomplished by the patients had certainly paid off. The County Asylum took great pride in their farming efforts. In 1917, Superintendent R.W. Poston opted to purchase a registered Holstein herd. By improving the farm’s dairy herd, the Poor Farm and County Asylum could increase revenue and continue its operation. Poston’s decision proved to be worth it: the herd won 33 National Holstein Progressive Breeder Registry awards and was one of the most well-known breeding establishments in the country (Hawkinson). Despite the farm’s success, labor laws and government regulations were beginning to change. By 1958, the Asylum’s timeline was beginning to shorten. The Poor Farm closed its doors, several buildings were torn down, and parcels of land were sold. According to the County Press Release titled, “Demolition of Former Health and Human Services Building” written in February of 2015, by 1971 “new state regulations prevented county hospital residents from working on the county farm.” It was later decided to auction off the prized dairy herd. Finally, in 1990 the herd was sold at an auction attended by approximately 1,200 farmers. The St. Croix County herd was well-known for their quality cattle and many farmers were anxious to bid at auction. The original St. Croix County Asylum was unfortunately torn down in 1984. A relic of our county’s medical and agricultural history was lost, only to be remembered now by photographs and memory. According to the County Press Release, the main reasons for its demolition were, “The maze-like layout, dark corridors and numerous exterior courtyards and entrances were not very conducive for office space and the provision of services to the public. The building also proved difficult to secure.” The County Asylum is a fascinating piece of local history that both reflected advances in medical knowledge and the culture and perceptions surrounding mentally ill citizens. For more information regarding the County Asylum please visit the Hudson Library’s History Room. Special thanks to Nancy Hawkinson of the Hudson History Room. Interesting ! My Great Grand mother was a resident for 30 years in the asylum.Carrie Nystrom.I wish I could get more information. The Historical Society’s research center may be able to help with specific questions or research requests. If you would like to do some research on your own, consider stopping by the History Room at the Hudson Library; there are many resources available there. The asylum was located in New Richmond so you could also check with the New Richmond Heritage Center to see what information they might have. My great uncle died at “the county farm,” as it was called, in 1957 after more than 20 years of confinement. Does the library have access to the records of individual patients?